I have been in New York visiting my son, but nothing came into my mailbox at home. On my way back relaxing on my train ride. I love the train. 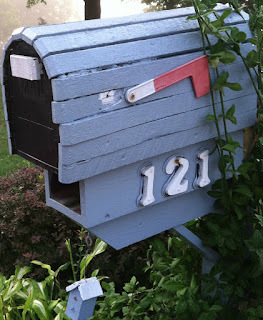 I finished a book and am checking out other blogs for Mailbox Monday. Enjoy your reading!!!! Have a safe trip!! I didn't get any either, enjoy your trip. Thanks...it is a nice ride as always except they keep it too cold. I finished a book and am looking at other book blogs. We even went to Quebec City - I will post about that later. I am enjoying it a lot, but they have the AC so cold....I have on my winter coat, a scarf over my head, a headband, and I did have gloves on. LOL!! Thanks for stopping, The Bookworm. Oh, I love the train too! I am thinking of taking it up north to visit my son and his wife, along the Oregon coast. Thanks for visiting my blog. You will LOVE the train, Laurel. Much less stress than flying. That train route most likely will be beautiful. I commuted by train for twenty years when I worked in downtown Chicago - much, much nicer than driving plus I got an extra hour of reading time every day. Have a nice, relaxing week. It is very relaxing, and getting reading done is a major plus. I had a nice time, Anna.